Global forces—economic, political and technological — threaten communities in many ways. On the one hand, citizens may feel like they’re part of an undifferentiated crowd with no personal identity. On the other hand, they may feel isolated and alone, disconnected from the human community. In either case, people—especially those with fewer economic resources—feel that they have little control over their future. The consequences of powerlessness, real or perceived, transcend the individual; society as a whole suffers, for it is deprived of social intelligence and energy which could be tapped for the amelioration of social and other problems. As a matter of fact, many of this century’s most pressing issues—the environment, women’s issues, sexual identity, and others—have been brought to the fore through the efforts of citizens (Habermas, 1996). Disempowering the individual and the community was probably not part of a master plan any more than degrading the environment was. Yet in many ways this is what has happened. Rebuilding the community—like cleaning up toxic dumps or reclaiming buried streams—will be a long process that will require diligence and patience. Rebuilding—and redefining—the community, therefore, is not optional, nor is it a luxury. It is at the core of our humanity; rebuilding it is our most pressing concern. Geographically based communities are a natural focus for addressing many of today’s problems. For one thing, many current problems—poverty, crime, unemployment, drug use, and many others—are concentrated in geographic communities. These problems are manifest in the community and are best examined and addressed by the community. Communities are also a familiar and natural unit. Smaller units can be clannish, unrepresentative, and powerless, while larger units are often too anonymous and unwieldy. The old concept of community, however, is obsolete in many ways and needs to be updated to meet today’s challenges. The old or “traditional” community was often exclusive, inflexible, isolated, immutable, monolithic, and homogeneous. 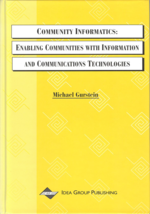 Moreover, increased mobility coupled with widespread use of communication systems is de-emphasizing geography as the sole orienting factor in a “community.” And, although problems may be manifested in specific geographic communities, the contributing factors of the problem may exist in New York, London, Tokyo, or other nodes in today’s “Network Society” (Castells, 1996). A new community—one that is inclusive, fundamentally devoted to democratic problemsolving, outer-directed as well as inner-directed—needs to be fashioned from the remnants of the old community.